← Celtic symbols, W.B. Yeats and my main character…. To Kill a Mockingbird has always been my favorite book. Though I’ve read it more than twenty times, it never gets old, stale or outdated. One of the most recognizable themes from the story is to consider things from another’s point of view…you know, the old “walk a mile in someone else’s shoes” adage. It’s timeless advice. There are many times when I don’t understand people’s actions or behaviors and I’m sure it works the same in reverse. It is then when the visage of Gregory Peck as Atticus hovers in my mind and advises me to step back and look at things from a different perspective. Just as it worked for Scout it has given me important insight at challenging moments. Each of us comes from different circumstances, different life experiences, and we can’t be expected to think and behave the same. Thank goodness for that or things would be tremendously boring. In The Quarry’s Child, the three main characters will find themselves heeding Atticus’ timeless advice at different points in the story. Meg, Clare and Hugh are distinct individuals, all with important outcomes at stake. It is in their darkest and most insecure moments that each will have to consider things from a fresh perspective to focus on a task at hand. In doing so, it will give their lives new meaning and enrichment. If we aren’t to repeat the mistakes of the past, isn’t this crucial? And if we wish to remain open-minded, isn’t this an integral daily practice? Atticus didn’t approve of Bob Ewell’s behaviors but he understood them because he took time to consider why Bob did what he did. We don’t have to like what some others do but, before we condemn them, we really should try to understand their actions. This is difficult at times in our society: our health care system is a mess, our educational priorities are too focused on numbers and not on kids, and our nutritional practices have gone to some dark place. Kids are obese and sedentary, yet our schools are often forced to cut physical education programs. Kids can text and make films but can’t write a complete sentence and don’t understand why that is an important skill. Our elders have so much wisdom to impart but we don’t value them and don’t treat them with the dignity they deserve (at least our health care system doesn’t). It’s time for us to expect more of our elected officials, especially if they are wealthy and haven’t experienced life the way the rest of us have and do. Atticus probably has TMJ from grinding his teeth watching us drive ourselves into the abyss (in nice cars and wearing name-brand clothes, though). 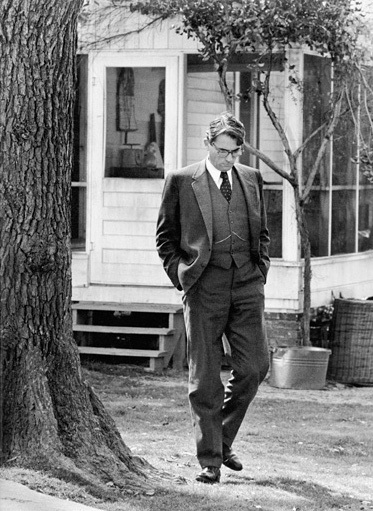 And Atticus, I’m sorry I’ve affiliated you with a quasi-political diatribe but I know you would understand because you’d put yourself in my shoes. This entry was posted in Atticus Finch, inspiration, life lessons, literature, perseverance, reading, role models, teaching. Bookmark the permalink. 5 Responses to What would Atticus do? Me too! Mockingbird is by far my favorite book. I always loved to teach it—although I have to confess that, with my students, I always taught the Brown/Cusato “abridged” version. (Atticus would understand!) The movie is one of my favorite movies, also. My students used to groan when they realized it was black & white but they always ended up loving it, and some even said it was better in black and white. IAs far as movies, a close second for me —and for my students— is the Sidney Portier Raisin in the Sun.) I was just thinking about Atticus as I was reading about the Trayvon Martin/George Zimmerman tragedy. Thanks for this post, Beth. I still love teaching the book, never get tired of it. And the movie is one of the best adaptations from a novel I’ve ever seen. You’re right about the students. They complain but love it once they start watching it! Atticus also teaches us that it doesn’t matter who you are or where you came from because you are still a person, and you should be yourself. You see this especially through his relationship with Scout and her not-girlish ways and with Tom Robinson; he is accepting and loving without being unnecessarily forceful and judgemental.